If you would like to pay for the catalog using Paypal, click ADD TO CART button on right else click Shopping Cart button above. Spring 2017! 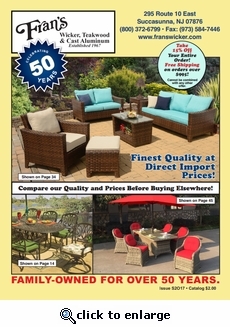 Thank you for your interest in Fran's Wicker & Rattan Furniture! We ship our catalog via First Class mail within two business days! We love hearing from you.